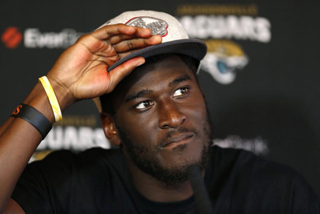 Nearly two years after Justin Blackmon’s last NFL practice, the Jacksonville Jaguars have all but given up on the suspended receiver. General manager Dave Caldwell said Tuesday he’s pretty much lost hope Blackmon will return. Caldwell hasn’t had any contact with Blackmon in some time and believes the former Oklahoma State star’s skills would be diminished if he was reinstated by the league. The NFL suspended Blackmon indefinitely in November 2013 after repeated violations of the league's substance-abuse policy. But then the Jaguars stopped getting updates about Blackmon, and pictures surfaced on social media sites earlier this year in which Blackmon appeared significantly heavier than his playing weight. “I don’t know what to expect, but I would say common sense would probably be if you haven’t played football in 2 ½ years, apparently that's not a priority for you,” Caldwell said. The Jaguars have mostly moved on. They drafted receivers Marqise Lee and Allen Robinson in the second round in 2014 and then added Allen Hurns as an undrafted free agent The trio combined to catch 136 passes for 1,647 yards and nine touchdowns as rookies. Since Blackmon’s suspension, Caldwell had viewed any chance of his return as a luxury. Now it’s more of a long shot, at best. The Jaguars could part ways with the fifth overall pick in the 2012 draft, but keeping him on the roster presumably could give someone in need a little hope. It also gives the Jaguars the first opportunity to evaluate Blackmon if he ever is reinstated. Blackmon caught 29 passes for 415 yards and a touchdown in the four games he played in 2013 and was the team’s leading receiver during that stretch. He has 93 catches for 1,280 yards and six scores in 20 career games. But his problems have overshadowed his play.